Capri is a beautiful, full Bolivian lady with a sweet, gentle temperament. She is a proven producer with excellent mothering skills. This lovely, light fawn girl has fantastic fleece with a wonderful soft, velvety handle. She is a real pleasure to see in the field. 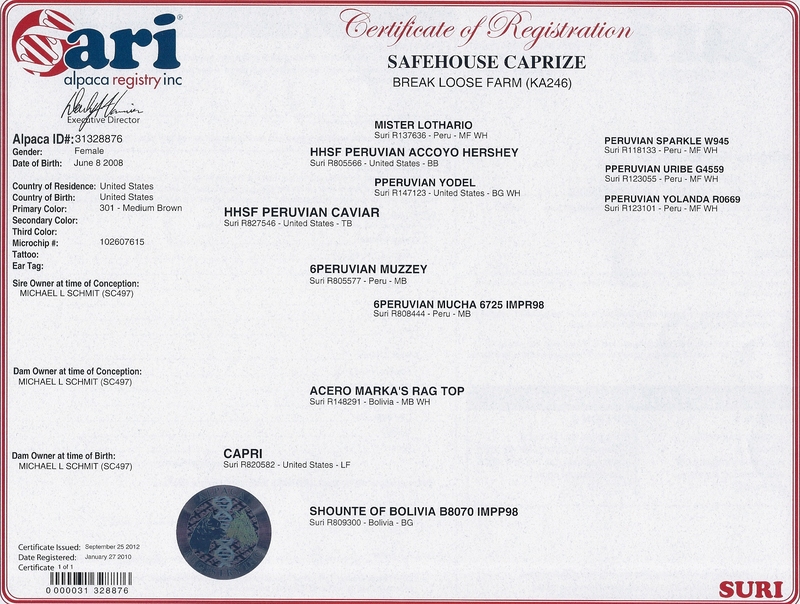 Caprize is an exceptional daughter of one of the great color producers Peruvian Caviar. She has impressive fleece, a beautiful head and wonderful conformation. Caprize is a beautiful, medium red-brown, with EXCELLENT SURI FIBER for spinners and knitters that is great to work with - bright color with high luster, very fine and consistent. It’s gorgeous and soaked in luster. This is a fantastic price on a great quality Suri female. Her Sire HHSF Full Peruvian "Caviar" Accoyo is an outstanding Herdsire. 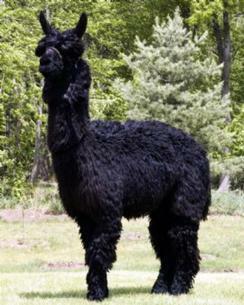 Caviar was a True Black Suri herdsire from HHSF Peruvian ACCOYO HERSHEY. Caviar's show record includes 1st Place AOBA Southeast PA Show, 1st Place 2003 Ohio Alpaca Fest, and 1st place 2004 Kentucky Classic. 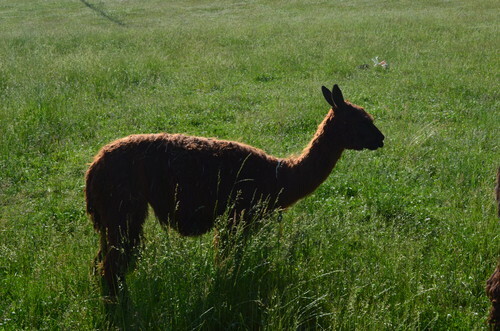 Her dam, Capri, a Light Fawn, Full Bolivian beauty had a sweet, gentle temperament. She is a proven producer with excellent mothering skills. 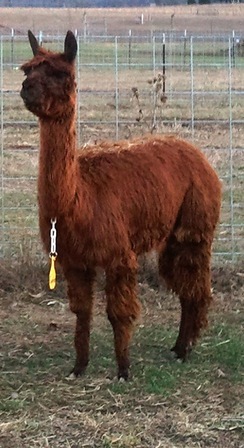 This lovely, light fawn girl had a fantastic fleece with a wonderful soft, velvety handle. A real pleasure to see in the field. Caprize has produced 2 beautiful Chocolate girls when bred to our TB herdsire, Ignite. 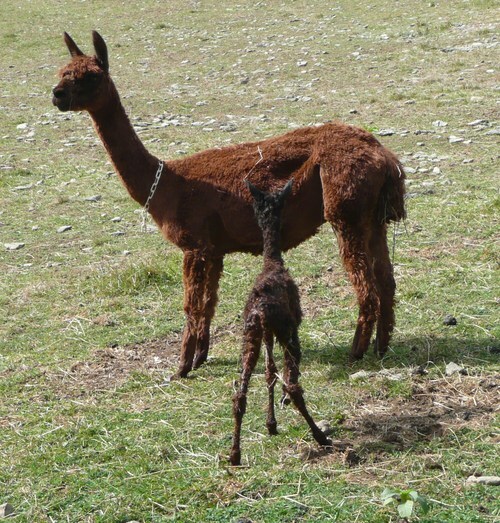 She delivered her cria very easily. Take advantage of this opportunity to add beautiful color to your herd at an outstanding price.